First of all, please remember that if the dog has a guide dog harness on, he is working. Do not pet the dog as this will distract him from his work and could cause harm to the owner. Legitimate guide dogs are given special privileges by law and are allowed to enter businesses even when other dogs are not allowed. Unfortunately, there are some bad apples out there who try to pass off a normal untrained dog as a guide dog. These type of people make life difficult for legitimate guide dogs and handlers. As of March 2011, a service animal is a dog that has been trained to do work or perform tasks for the benefit of an individual with a disability, including a physical, sensory, psychiatric, intellectual, or other mental disability. 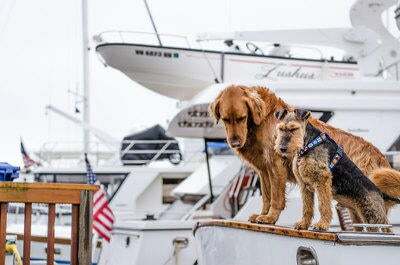 Service animals are required to be leashed or harnessed except when performing work or tasks where such tethering would interfere with the dog's ability to perform. Service animals are exempt from breed bans as well as the size and weight limitations. Emotional support dogs and therapy dogs are not the same as service dogs. Emotional support dogs are used when a doctor feels a disabled or elderly individual would benefit from the companionship, affection, and focus on having an animal around. Although these dogs can be allowed in no pet housing and may be allowed to travel with the owner on flights, they are not task trained and do not have the same privileges as a service dog. A therapy dog is trained to go into hospitals and aid in the treatment of individuals. Although these animals have a large amount of training, they still require permission to enter businesses, even the hospitals where they are used. Today, there are many types of service dogs, not just the seeing eye dogs that come to mind for most of us. There are dogs that are taught to alert the hearing impaired to sounds that are important, such as phones, cars, alarms, etc. The mobility dog is trained to perform tasks that the handler is unable to do, such as picking up items, getting things off of a shelf, keeping them from falling, getting in and out of a wheelchair, etc. There are also dogs that are able to detect when seizures will occur and alert the individual, these dogs are able to assist the handler during and after the seizure. These dogs are unique and no one knows exactly how they can sense this. Some dogs can also sense changes in blood pressure or blood sugar levels and alert the handler to potential problems. Many dogs are now being trained as psychiatric dogs. These dogs are used by individuals who have a disabling mental disorder to help them perform normally in many situations. Often times medications can make the handler dizzy or disoriented and the dog can guide the individual to a safe place. Some people wander off associated with their condition and can wander in to traffic or other situations that can be dangerous, the dog can prevent this. The list of ways that dogs can help is almost endless. Many of these guide dogs have saved owners lives because of their abilities. We treat several guide dogs and know how important these dogs are to the handlers and how much they help them every day. Please be respectful of any guide dog that you see. Allow the dog to do his job and do not interfere except to offer assistance.